la la la la. Yes another Monday completed. I haven't felt very well the past couple of days. On Saturday I was all clamy and flu like but with no cold, headache or sore throat - a bit odd. I felt better on Sunday but today I am again all clam like with a hint of a sore throat. My youngest has a chesty cough so maybe he passed on something to me. The joy of children starting Reception class - they pick up lots of bugs and what not. Talking of which his speech is much improved! Only a month since his tongue tie was cut and already you can hear an improvement. I have a speech language review appointment this week which will help the school - they have a therapist that comes in every week which is terrific. The bog standard response to feeling under the weather is "its the time of year" and I'm quite happy to take that. Its better than being seriously ill isn't it? Hopefully I can shrug it off which I normally do although the boot camp for tomorrow isn't looking very good for me. I really want to go as the chap has just added another session to the Friday one and I really love it once I'm there. I'll see how I feel in the morning. I went on Friday after a weeks absence - my little fella was sick on the Friday morning I was due to workout out so I kept him off school. Thankfully I haven't had the pain in my legs I had the first time I worked out at 'boot camp' although it is actually billed as legs, bums and tums pah ha ha! My bike is gathering dust in the shed - I don't feel the same about cycling at the moment or swimming. Its not particularly cold out so I don't know why I feel this way. Maybe I just like to mix it up a bit - I'm going to do my pilates on Thursday. ...and no I didn't get it for free to review (another book I have and am looking forward to reading it). My friend did ask all suspiciously "why have you bought this?" wondering no doubt if I was on the edge or desperately unhappy. And I suppose if you buy a book like this then something must be up with your life. I bought it because Bradley Wiggins used this to become successful as have other athletes and also because I thought it would help with my snails pace approach to just getting on and losing weight. I know I can motivate myself to exercise and I know what to eat and what not to eat - so why can't I do it consistently. I've found the book very useful (I haven't finished it yet). In a nutshell it explains the workings of your brain as "the human", "the chimp" and the "the computer". The chimp is your emotional reaction to everything. The chimp is 5 x stronger than the human and you will never be able to control it - you can only manage him. So this is the reason you don't have willpower. I also like the part on breaking the totally useless emotion of beating yourself up if you haven't achieved something by simply replacing "should" with "could" - I could lose weight and then writing all the things on how to achieve this is far more effective than saying I should lose weight and then writing all the things that have prevented you in the past. He talks of stop 'treading in treacle' as in going through the things that have made you fail in the past - it is pointless. 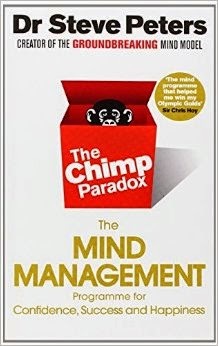 The chimp has no concept of consequences and only acts on pleasure and emotion - this is way you just shove something in your gob without thinking. Its your chimp! If you can pause and switch to your human who will think - do I want to be shoe horned into these jeans forever more and will this biscuit help me then you are more likely to see results. Also things like replacing "why?" as in "why can't I lose weight?" "why me?" etc which is very victim like (no one likes a victim) to "how" just a simple word can mean so much "how can I lose weight" "I could lose weight" has a far more positive and helpful impact. I also like the the chapter on thinking to yourself "do I want to feel like this?" and if you are going to react in a chimp like manner to say "change" pause and stop yourself. My husband naturally takes the piss but I think he is all chimp even ape! Potentially this book could serious numb any ranting behaviour - well for the time being. I shall head off as I'm not feeling that great. I could return and I shall return and tell you how I'm going to continue to lose weight. That book sounds like something I should read too. Now onto my tbr. Hope you feel your normal cranky self really soon. Cheers from Carole's Chatter!